I have already explained how to create database/server in SQL Azure at “Create database & Server in SQL Azure”. You can manage your database and server from Azure online portal itself. Not only this but you can even create/drop any object with DML operation too, from online portal but what, if you are so used to with SQL Server Management Studio? Yes, there is a way to connect your Azure database from your local SSMS (SQL Server Management Studio). 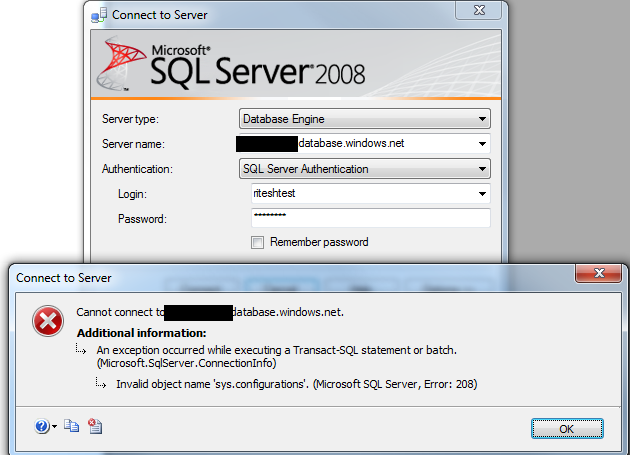 Before you start connecting your SQL Server Management Studio to SQL Azure, please refer “Create database & Server in SQL Azure” if you don’t know how to get fully qualified SQL Azure server name, database name and password. If you already have these three, do proceed towards your SSMS. 2.) 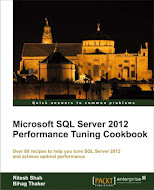 Select “Database Engine” in “Server Type” dropdown. 5.) Insert your login id / password and click on “Connect” button. When you open SSMS and the login prompt you get is representing the “Object Explorer” and at the moment SQL Azure can’t be connected from “Object Explorer” but don’t worry, there is a workaround to this issue. Close that login prompt and click on “New Query” from the standard tool bar, right below the “Edit Menu”. You will again get login prompt, insert proper credentials in the same way I saw in above steps 1 to 5 and you will be able to connect to your SQL Azure server. This entry was posted in Microsoft Cloud, SQL Azure, Windows Azure and tagged Microsoft Cloud, SQL Azure, Windows Azure on October 19, 2012 by Riteshshah.